Goodbye November. Hello New Estate Plan! November is coming to a close and the end of the 2015 is upon us. Now is the time when many Americans begin to think of what they are thankful for while simultaneously considering what they want to change in the coming New Year. Health is usually a top contender on the “Thankful” list while living a healthier life ranks in the top three on the “Things I’d Like to Change” list. Your health is something that should never be taken for granted considering how fragile life is and living a healthier lifestyle will most definitely improve your health. However, less stress and peace of mind will also lead to a healthier you. Consider adding to your list creating an estate plan and achieve ultimate peace of mind for both you and your loved ones. Did you know that without an estate plan your estate will be subject to probate? Probate is the method by which your estate is administered and processed through the legal system if you die without a will. This means that your debts and taxes will be paid before your beneficiaries receive their inheritance. This also means that you have no control over who receives what or how they receive it; meaning, someone you may not even like could end up with all that you have worked for. Fortunately, there are legal methods that allow you to make the process of distributing assets after death less costly, less stressful and that allow you to remain in control. First, consider a Will. Creating a Will is the first step in the right direction to help ease the stresses associated with the probate process; however, this is not all that you will need. Consider placing your property in Trust to protect it from creditors, to control the manner in which your assets are distributed and to avoid probate all together. Also, be sure to have an estate planning attorney draft a Power of Attorney, a Living Will and a Designation of Healthcare Surrogate as part of your estate plan. These documents will not only ensure that your family will be protected but they will also designate an individual you trust to make legal and health related decisions for you when you are no longer able to make them yourself. Planning for the future will save your family members additional grief, unnecessary stress and allow you to control how and to whom your assets are distributed. An attorney that specializes in estate planning can help explain the legal tools that are available to each individual depending on their specific goals. As November passes and the New Year approaches, add scheduling your free consultation with Wild, Felice & Partners, P.A. to your list and allow our attorneys to provide you with peace of mind. For more information on successful Florida estate planning and asset protection techniques, please contact the South Florida law firm of Wild Felice & Partners, P.A. at (954) 944-2855 to schedule your free consultation. Tommy Hanson of the Atlanta Braves passed away last week from Catastrophic Organ Failure. The former Atlanta Braves pitcher was experiencing trouble breathing on Sunday when he was rushed to a nearby Atlanta hospital. The death was completely unexpected as the pitcher was only 29 years old and appeared to be both healthy and strong. “Big Red” as he teammates affectionately called him, will certainly be missed. 2. Identify and achieve your goals: Is your biggest concern designating a guardian for your children? Or perhaps you wish to ensure your family is not subjected to probate. Perhaps you wish to control your assets from beyond the grave. Whatever your goals are, allow our attorneys help you to achieve them. 3. Help you choose the correct technique for protecting yourself, your wealth and your loved ones: There are many techniques used to protect yourself and your family. Your goals will determine which technique is best for you. Some of these techniques include: The Last Will and Testament, Irrevocable Trust, and a Living Trust. 4. Durable Power of Attorney: A durable Power of Attorney allows you to designate and authorize someone to legally act on your behalf, in the event that you are unable to do so. Not having one could mean that someone you don’t like could make your financial decisions. 5. Healthcare Surrogate and HIPAA Release: A HealthCare Surrogate allows you to designate and authorize someone to legally act on your behalf and make important healthcare decisions, in the event you are unable to do so. A HIPAA release will allow the authorized individual to pull your medical records to aid in making important decisions. 6. Living Will: The Living Will will convey your wish to either be kept alive artificially or instruct the doctor to pull the plug. Life is filled with unexpected twists and turns. Create an estate plan today to protect yourself and your family for tomorrow. We are all growing old; there is nothing we can do. Or is there…? One in seven Americans are over the age of 65. This means that those who have cared for us as children are growing old and are beginning to need us to now care for them. Seeing our parents and grandparents weaken, we want to be sure that they will be provided with the upmost care for the remainder of their life. However, properly planning for the aging population is complicated and requires the help of a competent attorney. -Explain what long term care is, help you to understand the costs associated with this type of care and explain how the government can help alleviate the bill. -Review and update an old, outdated estate plan. Due to life’s ever changing nature (divorce, marriage, remarriage, children, growth in wealth, etc) and the fact that we are aging daily (plan for your incapacity by designating your durable power of attorney and healthcare surrogate), we recommend meeting with an experienced estate planning attorney once a year. If you don’t have an old estate plan to update then now is the time to get one in place. An estate plan not only protects your assets, it also provides peace of mind! Protect yourself and your assets by creating or updating your estate plan with one of our experienced estate planning attorneys. -Help you to better understand the difference between Medicare and Medicaid and how these programs may benefit you or your loved ones. -Help you to better understand Veteran Administration benefits and how they can pay for long term care. Elder law is a broad field and can be extremely complicated. Therefore, it’s necessary to work with a competent elder law attorney in order for any plan to work. Call the offices of Wild, Felice & Partners today at (954) 653-2917 and schedule your free consultation. Allow our attorneys to help your loved one receive the best long term care, the most benefits and achieve peace of mind. To learn more about the benefits of elder law visit. http://wfplaw.com/Elder-Law.html. Should Turkeys Have Estate Plans? Thanksgiving dinner is full of estate planning tips. The turkey reminds us that life is often shorter than we expect and putting off that estate plan until tomorrow could prove disastrous if you end up stuffed and roasted or even deep fried. The candied yams show us that even something that looks boring can be incredibly important when prepared correctly. The vegetables on our plates are a good analogy for the necessity of a legally valid Living Will… well, for obvious reasons. The pecan pie doesn’t remind me of anything but I really like pecan pie so I thought I should mention it anyway. This Thanksgiving let’s learn from our delicious dinner. Don’t just be thankful for your family and all that you have, protect it! Living Trust – The Trust will keep the assets it hold segregated from your estate which will allow the assets to avoid probate (the legal process of determining whether a will is valid). By avoiding probate you remain in control and can choose who receives what and how they will receive it. Assignment of Property – This Assignment of Property does just that: assigns your property to your trust. This includes both real & personal property. This document is important because a Trust without property is ineffective and useless. Last Will & Testament – The traditional will that is used upon death to distribute property to beneficiaries, specify last wishes, and name guardians for minor children. Durable Power of Attorney – Designate and authorize someone to legally act on your behalf, in the event that you become incapacitated or otherwise incapable. Combination Living Will & Designation of Healthcare Surrogate – Outlines important healthcare decisions in advance, and allows for you to appoint a healthcare surrogate to make healthcare decisions for you when you become unable to do so yourself. 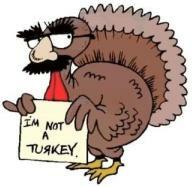 Don’t be a Turkey this November, get your estate plan today! Schedule your free consultation by contacting the South Florida office Wild, Felice & Partners, P.A. at (954) 944-2855. To learn more about Estate Planning and Asset Protection visit our website at www.wfplaw.com.